A performance in two halves. 50 people arrive at a pre-ordained time and place. 50 people find their seats in the half-light. 50 mobile phones are switched to silent. The houselights dim and 50 pairs of eyes adjust to the dark… Lights, Camera, Action! A Night To Remember is about what it means to get lost in the action, to fancy the hero and cry at the sad bits. It’s about trying to piece it all together and pretend you don’t already know how it’s going to end. 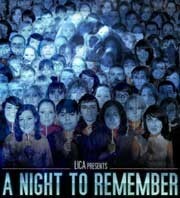 Devised and performed by LICA's first year Theatre Studies students. Directed by Matt Fenton, Leentje Van de Cruys and Piotr Woycicki. Light and sound design by Steph Sims and Dom McKenna.